Vanguard races onto the 3DS in April, bringing a new dimension to cardfights. Just this morning, the splash page for the Cardfight!! Vanguard Ride to Victory! video game was updated, converting it into a full website. While many features are stilled locked, a demo video was posted under the game outline to give a hands-on look at what the finished product will look like, using the Hotblooded protagonist (here named 主人公 "Main Character" as he was in prior screenshots) fighting Morikawa Katsumi as an example. Ride to Victory will be released in Japan on April 11th, 2013 for the Nintendo 3DS. The game is touted as a "Vanguard Fight Simulator," featuring both a full storyline for the player to go through as their own custom character, and wireless multiplayer for cardfighting with friends or randomized opponents. The game will feature more than 1300 cards ranging from BT01-BT09 and TD01-TD07, including every card from the start of the series up to the conclusion of the Asia Circuit, has received a B rating from CERO and will retail for 4980 JPY, before applying tax. 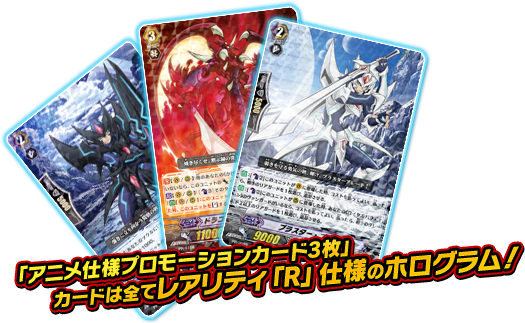 Each copy will include PR cards, Blaster Blade, Blaster Dark and Dragonic Overlord, with promotional artwork done by Studio TMS, who have previously made similar alternate artworks for Wingal and Soul Saver Dragon. The cards themselves will have a special foil treatment, being treated as if they were R rarity cards from a regular booster pack. Due to the region locking on the 3DS, only Japanese 3DS systems can play the game. Importing will in most cases, not be possible.